About a month back Hitachi released a 320 GB 7200 RPM laptop drive. The new drive offered me 60% more space (the difference between having a mostly-full hard drive and a half-full drive) plus modestly better throughput and lower power consumption. What's not to like? 1. Run my normal incremental backup of the 200GB drive to my external back-up hard drive using Retrospect Express. I like it 'cause it does a real file-by-file verification. 2. Use Carbon Copy Cloner to clone the 200 GB drive to my external drive. Belt and suspenders, because from this point I'm working without a net. 3. Boot up from the external drive. (Y'all make your external backup drive bootable, right?) Secure-erase and reformat the 200 GB drive, because I'm going to sell it. 4. Open up the Macbook Pro, swap in the new 320 GB drive, and close up the box. 5. Boot up from the external drive and partition and format the 320 GB drive. 6. Use Carbon Copy Cloner to clone the former contents of the 200 GB drive to the 320 GB drive. 7. If all has gone well, the 320 GB drive boots like it's supposed to, and I can bring the laptop back online. It's time consuming and a little nerve-racking. Just about the time I was getting ready to order the 320 GB drive, Other World Computing offered me a Newer Tech Universal Drive Adapter. The $30 UDA connects any standard or laptop sized IDE/ATA/SATA bare-bones drive to a USB2 port. 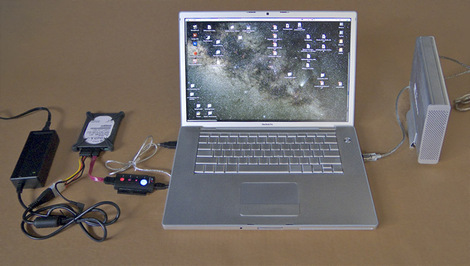 The Universal Drive Adapter includes a power supply and all the data and power connectors needed to operate an internal hard drive externally. Left: Here's the Universal Drive Adapter, aglow with power and data. There's nothing fancy about it, but there doesn't have to be to do the job. Other World Computing also sent me a couple of their $10 ProtectaDrive silicone rubber sleeves, designed to protect a bare-bones drive from shock, electricity, and static discharge. Nice! Suddenly, life was a lot simpler. I took my machine off-line, hooked up the new 320 GB drive via the UDA, rebooted from my external drive and used Carbon Copy Cloner to clone the 200 GB drive directly to the 320 GB drive. This is the setup I used to migrate the contents of my laptop's internal drive to the new drive. On the left is the power supply for the bare-bones 320 GB drive, next to it the drive in a ProtectaDrive sleeve, and connecting that to the Macbook Pro's USB2 port is the Universal Drive Adapter. On the right is my bootable backup drive, plugged into the laptop's FireWire 800 port. I set the 320 GB drive to be the new startup disk, leaving it attached to the UDA (Intel Macs can boot off of USB drives). Rebooting the system confirmed that the 320 GB drive was operational and bootable. Then I opened up the machine and swapped hard drives, closed everything up, and brought the system back online. It's a lot less complicated than the old scheme. Plus, I can hang onto my 200 GB drive with data intact for long enough to be sure that the new drive is happy. Once I'm confident of the new drive's reliability, I'll hook up the 200 GB drive with the UDA, scrub it, and sell it. The Universal Drive Adapter worked perfectly. Of course, it only works at USB speeds and on most computers those are pretty bad; on this Macbook Pro it's a paltry 18 MB/sec, which means it takes several hours to migrate all the data. Overnight's a good time. It'll take a very long time to do a secure scrub of the old drive, but it won't take my attention or require shutting down the system. • The short SATA cable included has the wrong connector orientation on one end, so you have to put a half twist in that very stiff cable to have both the drive and the UDA right side up. • The plugs on the SATA power and data connectors are about half a millimeter too wide; you can't fit them onto the closely spaced connectors on the hard drive without forcing things a lot more than I'm comfortable with. Fortunately the connector housings are soft plastic and a minute's work with a hobby knife trimmed the width enough so they fit on with no trouble. Hopefully Other World Computing will see fit to redesign the SATA cables in the next product run to eliminate both of these problems. All in all, a cost/time-effective solution to migrating data from one drive to another. Hurrah, OWC! Thirdly, use an ExpressCard/34 - eSATA adapter, and you'll get *blazing* fast performance, compared with what you got. What a wonderful warning against Macs and laptops! I'll stick with a normal PC box thank you, Windows & Ubuntu on one drive, data on a bigger second drive. Do you have a link for the Hitachi drive? Why not erase the old drive AFTER you know the backup was properly restored to the new drive? You made yourself "without a safety net" by doing that. You put your new hard drive into the external enclosure; boot to the included CD-ROM; tell the software to mirror your old drive onto your new drive; tell it to make the drive bootable; put the new drive in. That's it. I've done it on my old Dell Inspiron and a Lenovo T61p. The software supports Linux and Mac filesystems too. The reason I'm not keeping the 200 GB drive is that I've got 1.5TB of external storage in my office, and I don't need the extra storage in the field at this time. A year down the line I very well might, but the price of hard drives is dropping so rapidly that it makes more economic sense for me to sell this drive than to hang onto it. But I did seriously consider that option before deciding it didn't make sense in my particular case. For many people, slapping the old drive into an On-The-Go eSATA/FW case would be the most useful thing to do, and it would make the migration path extremely easy because you could boot off of the old drive in the case and clone its contents to the new empty drive in the laptop. Note that there is a $30 rebate for purchases made in the next six days. I considered that very seriously (before getting the UDA), but it creates different risks. It means opening up the laptop two more times and swapping hard drives two more times: once to put the old drive back in and erase it and once more to put the new drive back in. I'm an old hand at repairing laptops (you don't want to know how many times I've stripped my Lombard down to the bare frame and even replaced parts of the bare frame -- I'm very hard on my toys sometimes). Even so, I really don't like messing in these things more than I have to; there is always the small but real probability of breaking some little fiddly bit. The glued-down SATA ribbon cable in the Mac book Pro is a particularly nasty bit of work. Plus it's a few more hours of my time. So I decided that I preferred to go the belt-and-suspender route of duplicate bootable verified backups. Either way, it would have been more of a nail-biter than the UDA. The first part of your "warning" is wrong. I've migrated Windows laptops, too. The process is almost identical; some of the details and software change, but it is fundamentally no easier nor harder (actually, for the only-semi-skilled user, it's harder, because external booting and drive cloning is not as transparent nor user-friendly, but that's a nitpick). Religious OS wars are boring; I refuse to play. The second part of your "warning" is simply off the mark. If you need a laptop, you get a laptop. If you don't, you don't. Laptops are still more expensive on a performance per dollar basis than desktops, so if you don't need one you don't buy one. And if you do, the limitation that laptops only come with one hard drive bay is just a fact of life. Treating it as a warning against laptops would be kind of like warning 35mm camera buyers that view cameras were preferable because they had swings and tilts. Truly misses the point of what people are likely to be buying 35mm cameras for. Oh, and by the way, if your desktop machine has every available bay and hard drive I/O port filled, it's absolutely no easier swapping out the system drive. Been there, done that. I'm glad you're happy with your system, but you've hardly anything to be smug about. You've got what works for you; I assure you that it wouldn't work for many people. Aren't there USB/FW enclosures for laptop drives? You could then format+partition+clone the new drive using the enclosure then swap the internal disk with the newly cloned one and work with the old drive in the enclosure until you are done with it, or use it as a portable drive. It would work essentially as the UDA, without some of the cabling spaghetti and, if using FW, with improved transfer rates. - Restarted the Laptop using the new Externaly attached 320G to boot and test the data. BTW, the new drive is MUCH faster than the 120G I used to have in my MBP 15". Yup, that works. And it's a smart way to go if you plan on keeping the drive. If you don't, the UDA is a cheaper solution and involves slightly (perhaps insignificantly) less work. Good for you! The screws didn't give me any trouble; frankly it's a hell of a lot easier to strip down this machine than my old Lombard. I think the repair folks finally got the message across to the designers. Trust me, it will go a lot faster the next time you decide to replace the drive. I've benchmarked your old drive and the Hitachi drive. There's a full factor of two difference in performance. Almost everything runs noticeably faster. It's a little too late to be mentioning this, but there isn't a good reason for setting up a separate Photoshop cache partition, unless you think your hard drive is going to get VERY full (mondo fragmentation). I did what you did when I had installed the 200 GB drive on the assumption it would help, but when I ran my Photoshop performance tests I got almost exactly the same results putting the scratch space on the cache partition and on the main partition. Either the improved transfer speed just trades off against the longer track access times or both of them are fast enough that you're not seeing significant system lag due to either. Kind of a case of locking the barn door etc. etc., and 8 GB isn't much to worry about, but if you have some reason to reformat the drive or if you have live partitioning software, you might as well roll the cache partition into your main one. On the other hand, I do have a 30GB separate cache partition on my external drive, because I put all sorts of crap on that drive and I do expect to run it until it gets almost full. No more or less pain than what I actually did with the UDA, but that's a nice "turnkey" setup for only $10 more. 'Course then you've got a useless USB2 enclosure... (well, I consider them useless)... but if you don't care about that it's good. One problem with these USB/SATA cables is that the drives tend to get quite hot. I now use a Thermaltake BlacX SATA-USB2 dock (there is a Firewire version). It does essentially the same thing as the cable (in a neater package). You just plug in a 3.5" or 2.5" drive into the slot vertically. The drives are exposed to the air and cool better than a drive resting on a non-metallic desk. Rather than Carbon Copy Cloner I use Super Duper to clone my drives & make them bootable. I tried both & found Super Duper was better. Or you could just carry another small external with you into the field and keep your main drive as-is until it dies, backing everything up as you go. I prefer to move my hassle as far as possible into the future as I can. Shoot, if a laptop lasts more than 2 years of heavy use you're lucky. And you might as well buy a new computer if it's over 3 as most of the hardware is simply not rated for 4 years of life. Even faster is this: either use your UDA or put the new drive into an ESATA enclosure for 2,5" drives (if you have an ESATA adapter for your laptop this will do the copying at the HDD max speed, i.e. 50-70MB/s) and the use Acronis True Image which makes clones your system hard disk without the need to boot from an external drive. (You install it on th old drive, tell it to clone the disk, it then reboots and finishes the cloning in ca. 2 hours). The you just swap the old and the new drive and erase the old one. in my last post I forgot, Acronis True Image is a Windows product... Anyway, this might be useful for Windows users. I could have used the drive adapter yesterday. I had an external fail (refuse to mount). This was after reorganizing a lot of my freelance/personal files, and some of what was on that particular drive wasn't backed up anywhere. Oops. Not raw files, but several hundred print files representing many weeks of scanning and production. Yeah, oops. I had to take apart another old drive to use the enclosure. Which didn't work, so after spending the afternoon in a state of semi-shock, I came home and reattached the drive to its original enclosure, and it mounted. Breathe sigh of relief -- and carefully pull the print files onto my laptop then back them up onto two separate externals. Whew. I immediately ordered two new external drives from OWC -- then saw your article this morning. Too late to add the drive adapter to this order, but it'll be on the next one. I just do not understand the need for the complicated procedure described in the post. Basically Ctein did follow your simpler procedure, except that he used the NewerTech UDA instead of an external enclosure. If he didn't have the UDA, he would have gone through the 7-step process, using his existing external HD. I don't think he wanted to buy an external enclosure. One tip for an extra partition in a laptop's internal HD is to use it as an emergency spare boot partition instead of a Photoshop cache. If your system crashes, it might damage the filesystem so badly that it won't boot. If you're on the road this is a disaster. With a spare partition you can boot from it (hold down Option at boot time) and then run Disk Utility to repair the main partition. Unfortunately Leopard won't install onto an 8G partition. I had to do a fresh install to another spare partition on an external HD, delete a bunch of unnecessary stuff (printer drivers, speech voices, and locales) and then clone that to the internal spare partition.